What’s that near orange lady’s crotch? Is that chick sporting wood? It looks like either a pouch or tassel. On another note, I wouldn’t mind growing my “beard” out and dressing up like Dr. Gordon Freeman or master chief. Now THOSE Are worth it. CT or T would be cool as well. I love those extra long strides that they’re all taking to examplify their aggression and power. 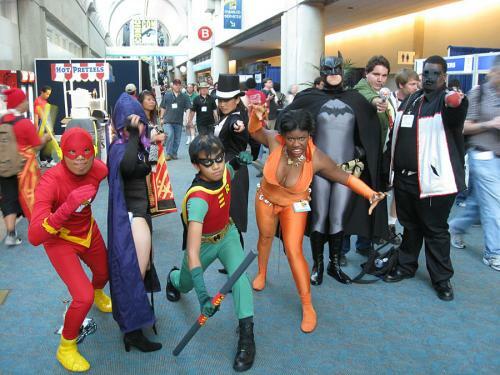 Is that a bo-staff that Robin is holding? He’s got bo-staff skills? fantastic. Hey, i was just at the comic con. Well, was anyways. I actually saw orange lady in person. and zombie person on right. One day, I hope I could be one of those weirdos..
Was that thing by her crotch as noticeable in person as it is in this picture, 356094? The black guy looks like he’s holding a poke ball. He’s the bizarro Ash Ketch’em from the Superman – Pokemon collaboration episode. Fat, black, and lost all hope – the exact opposite of Ash. ROFL. I dunno, is being a hyper-active furry fetished idiot savant any better? Black guy is Mr. Terrific, he’s holding a T-sphere, not a pokeball. That said, I have no idea what orange chick is supposed to be, anyone know? Zattana is quite good from the side. The magician chick in the back.